Motionless in White, often abbreviated MIW, is an American metalcore band from Scranton, Pennsylvania. Formed in 2005, the band consists of Chris "Motionless" Cerulli (lead vocals), Ricky "Horror" Olson (rhythm guitar), Devin "Ghost" Sola (bass), Ryan Sitkowski (lead guitar), and Vinny Mauro (drums). The band has stated that their band name derived from the Eighteen Visions song "Motionless and White". MOTIONLESS T-Shirts which we offer at Plain-t-shirts.co.uk forms part of our movie, games and music official merchandise range. 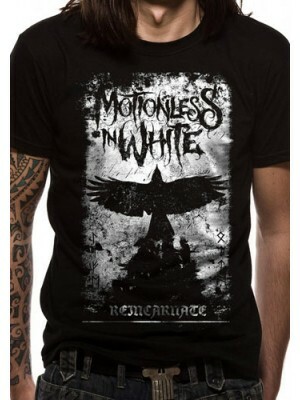 MOTIONLESS range we offer fast delivery all over UK/EU MOTIONLESS IN WHITE - PHOENIX (UNISEX) which we offer which you can..
Motionless in White was signed to Fearless Records for their first three studio albums; their most recent fourth album, Graveyard Shift, was released on May 5, 2017, via Roadrunner Records.